Bintan Island can be found in the Riau Archipelago of Indonesia which itself comprises around three thousand islands of varying sizes. 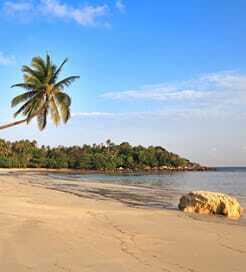 Bintan has a tropical climate with temperatures seldom dropping below 70 degrees F or above 90 for the majority of the year. The most popular time to visit is generally between the month of April and September. The main tourist attraction is Bintan Resorts, occupying the northern area of Bintan Island and is a fantastic holiday destination consisting of nine resorts facing the South China Sea. The island offers something for every traveller including beach fronted international hotels, some of the best golf courses in Asia, water sports and adventure as well as being an ideal destination for relaxation and wellness. For those travelling to the island by ferry, the departure port is across the Singapore Strait, just under an hour away at Tanah Merah ferry terminal, Singapore, with two ferry companies operating. The ferry crossing operated by Bintan Resorts Ferries with their four catamarans docks at Bandar Bentan Telani in the north of the Island while Sindo Ferry who operate the longer crossing to Tanjung Pinang sail to the west of Bintan Island. For more information, please visit our Ferries from Singapore to Bintan Island page.